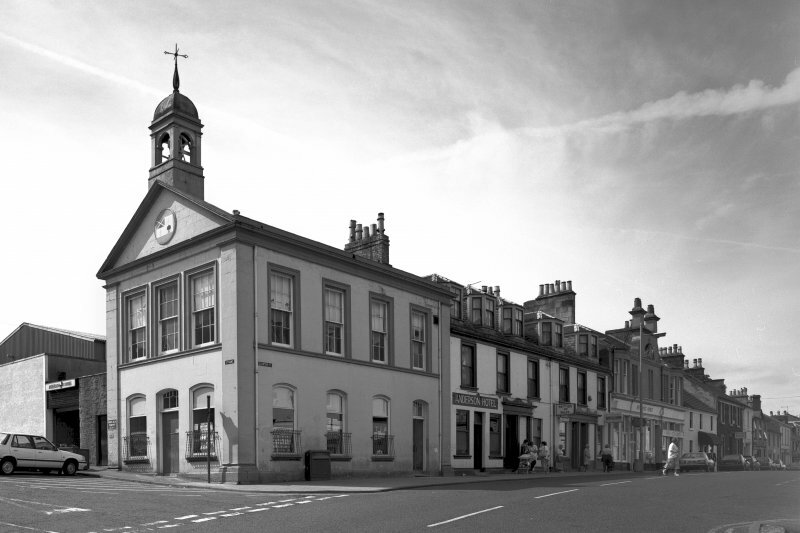 Situated at the corner of Strand and Eglinton Street in the centre of Beith, the town-house was constructed in 1817 by public subscription, and was owned by the subscribers until 1838. It is said to occupy the site of a tolbooth of 17th century date which housed the parish school on the upper floor but was abandoned about 1768. The town-house is two-storeyed and rectangular on plan, measuring 13m from E-W by 7.1m, and is constructed of sandstone ashlar. Its main (E) front is a pedimented design of three bays while the N front to Eglinton Street is of four bays. The angles of the building are marked by pilasters. While the ground-floor windows and doorways are unmoulded but have segmental heads, the first-floor windows are rectangular and have moulded surrounds rising from continuous sill-courses. The E pediment is surmounted by a round-arched bellcot, capped by an ogival dome and containing a bell 0.51m in diameter which was gifted in 1823 and cast by Thomas Mears. Originally the ground floor contained a small cell and shops which provided public revenue from their rents. The first floor, consisting of a large hall, was used as a court-room and a public reading-room. The building retains no early internal features.